Rodeos were introduced back in the early to mid-1800s as a way to display cowboy and ranch-hand skills like herding, calf roping, bull riding, and more. Forklift rodeos, on the other hand, have only been around for a few years, and they’re used to highlight driving skills and safe operation, all while having fun. That’s correct. You read correctly. Forklift rodeos. 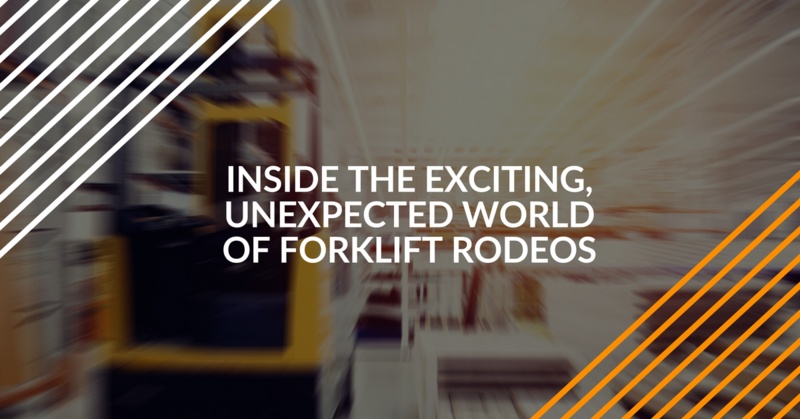 What are forklift rodeos about? How can they help enhance safety for every forklift driver – even ones that aren’t entered in the next forklift rodeo competition? Let’s look at some different forklift rodeo contests, along with how they can promote safety concepts for use in any work environment – warehouses, shipyards, construction sites, and more. ForkliftCertification.com, the leader in online forklift training and certification, has three different training packages to help you become a better, safer forklift driver. Can our training help you excel in a forklift rodeo? Perhaps – but first, a brief history of the forklift rodeo. Balancing – for example, driving through a course with a ball balanced on a cylinder. Forklift bowling – this popular contest has to be seen to be believed…check it out here! Dot Foods, a major foodservice distribution company based in Illinois, has become a noteworthy sponsor of forklift rodeos. In fact, their annual competition, the Dot Foods Forklift Rodeo National Championship, is widely regarded as the most hotly contested forklift rodeo in the United States. This rodeo is divided up into three separate contests: forklift, order picker (pallet jacks), and narrow aisle. As footage of their 2017 contest shows, forklift rodeo contestants have some serious skills! 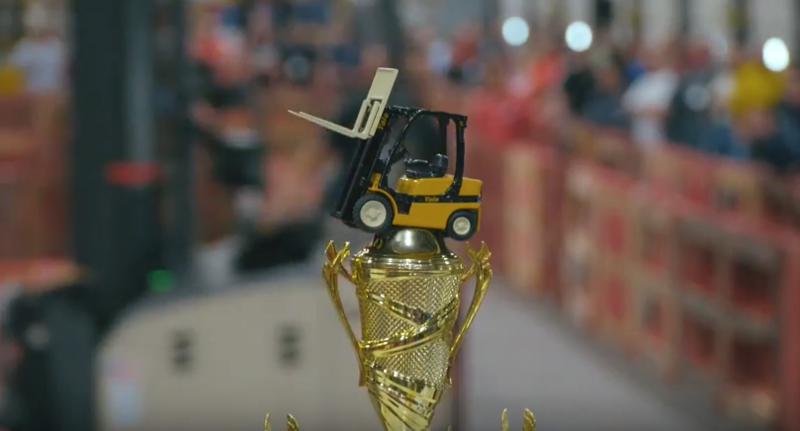 From balancing acts to pallet jack competitions, the Dot Foods Forklift Rodeo National Championship is the gold standard of forklift rodeos. What’s the ultimate prize for taking home the Dot Foods Forklift Rodeo National Championship? Last year’s winners were given the choice of an all-expense paid vacation to prime destinations like Disney World, the Bahamas, New York City, and more! Regardless of the competition, there’s definitely a brand new meaning to “lifting the cup.” Sports teams celebrate championships celebrate ultimate success by literally lifting a cup. The NHL has the Stanley Cup, Spanish soccer teams have the Copa del Rey, and countless other leagues honor league champions with a cup of some sort. Well, it’s time to give the forklift its due. After all, nothing can quite lift a championship trophy like a forklift! Looking to Acquire Forklift Rodeo Skills? We won’t show you how to win a forklift rodeo. Our training courses will, however, show you crucial OSHA safety regulations, explain real-world situations you can apply on the job, and prepare you for the career of a lifetime! If you’re ready to grab control of your forklift career and become the best possible forklift driver – and who knows, maybe a future forklift rodeo champion – then you’ll want to sign up for our training today. We’ll help you become OSHA compliant, and also make you a better job candidate. No matter where you work, employers are always looking for well-trained workers. Thanks for stopping by the FLC blog. For any questions about our training, drop us a line or call our OSHA certification consultants directly at (888) 278-8896.